An Undergraduate’s Parody Ski Song Led To An Academic Achievement. How did a ski silly ski song to the tune of a classic melody wind up on a Folkways record which became a classroom classic? As an undergraduate at Michigan State University in the early 1950s I joined the ski club, and I learned, among other things (like how to kick turn), a bunch of ski songs. We sang them driving up to Caberfae resort near Cadillac and apres ski in a local joint, The Pine Gardens. All wrapped in alpaca, and cold as der Schnee. Later as a graduate student in folklore at Indiana University I took a course on British ballads and learned that our Sun Valley song was part of a much older cycle of variations on the theme of “The Unfortunate Rake.” That’s “rake” in the archaic sense of a dissolute person, a libertine. Author Jan Brunvand, occasional singer of ski songs, in the 50s. One of my classmates, a rising star in folksong studies, was compiling a record of versions and variants of the “Rake” cycle. He enlisted me to sing the skiers’ version. Trouble was, I couldn’t sing worth a darn. So we got another fellow student who performed in a local folksong group to plunk guitar chords to keep me more-or-less on key, and I managed to lay down a decent track, as we say in the business. The LP was issued by Folkways Records in 1960, and there I was earnestly chirping my “Sun Valley Song” on the same disk as nineteen real folk singers, including Alan Lomax and Pete Seeger. “The Unfortunate Rake: A Study in the Evolution of a Ballad” became a classroom classic used to illustrate how texts change as they are transmitted via oral tradition. And you can listen to a sample of the “Sun Valley” song by clicking here. Even though this was my sole appearance as a folksinger, I make up in longevity what I lack in numbers. The Smithsonian Institution bought out Folkways and kept the entire catalog in print. 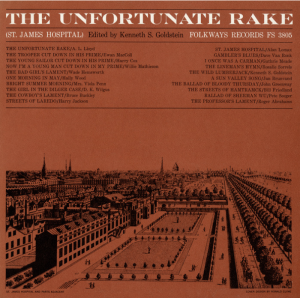 Their website offers “The Unfortunate Rake “ by “various artists” as a CD or a download. Or you can check it out on Amazon by clicking here. I still like to sing an occasional ski song, to myself, usually while cruising western slopes, including a few times even those at Sun Valley. 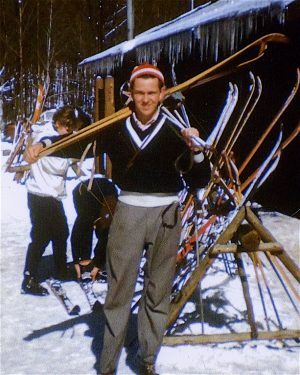 Jan Brunvand, born in 1933, was taught to ski by his Norwegian parents in Michigan. As an undergraduate at Michigan State University he skied Aspen and A-basin during spring breaks. After earning a PhD in Folklore at Indiana University he taught at the University of Idaho four years, skiing in local areas. After a skiless year at Southern Illinois University, he moved his family to Salt Lake City, teaching at the University of Utah for thirty years during which he published a textbook in American Folklore and a series of books about urban legends. He and his wife Judy have skied most of the resorts in Colorado and others in Idaho, Wyoming, California, and even Vermont. They have also skied in Norway, Chamonix, Zermatt, and for one memorable week in Portillo, Chile. In retirement, they ski mostly Alta, but also all the other fine resorts of Utah. They are active members of the International Skiing History Association. I didn’t compose that song, though I did make up a parody of “The Too Fat Polka” that was the subject of another piece of mine on this website. And I did not publish my performance; someone else did. So I really know nothing about publishing music, and my performing skills are minimal. Good luck with your composition! Hello from Indiana University, Bloomington, IN. I also skied in Michigan quite a bit.